Suzanne Kastner has been managing the Publishing Services group since 2002 and continues to manage this growing area of our company as a whole. In addition to these responsibilities, she oversees our content development team, which provides writing, development, and instructional design services to publishers and other educational providers. With a background in instructional design and research-based design principles, Suzanne has proven to be a dynamic force at Graphic World as she is in the forefront of our new offerings to customers. Suzanne is passionate about creating content that is not only accurate and clear but that aligns with learning objectives and results in learning. 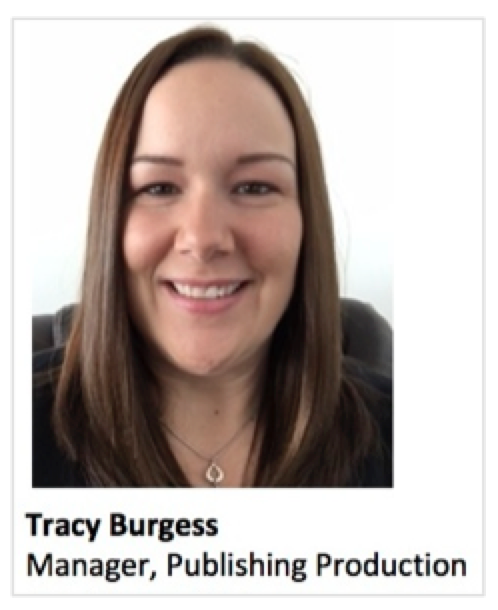 Tracy (Grace) Burgess is now leading our publishing production team, which provides project management and editorial services (editing, proofreading, and indexing) to a variety of publishers and global information providers. Tracy has a long history in publishing, working in book production, customer service, and journals editorial and production. Prior to taking on her current role, Tracy managed GW’s journals services team, which provides project management and editorial services to journal publishers. During her tenure, she was instrumental in streamlining processes, improving service, and implementing an accelerated training program for a growing journals team. Tracy is passionate about providing customer-first service and is a true collaborator, always looking for ways to improve processes. Carolyn Abram is the new manager of our journals services team. After joining GW as a journal manager, Carolyn quickly became an indispensible part of the team, taking on numerous leadership roles out of the gate. One of Carolyn’s key accomplishments was her critical role in the successful implementation of our comprehensive journals staff training programs. In addition, as a first adopter of new technologies and workflows, she commonly finds herself leading the way in developing best practices for the staff. In her new role, Carolyn is excited to continue focusing on training and staff development and growth and while ensuring we are providing outstanding service and quality to our clients. Newer PostPunit Dhandhania to become Business Development Advisor to Graphic World, Inc.